We have made it to California ! The land of sunshine and a whole lot of beauty. We are taking a morning off in Fort Bragg, a little town sitting on this amazing part of the coast. We were graciously put up by warm showers hosts last night, and they even took us, along with two other cyclists from Norway, out for local beer and $1 tacos! So, this morning we recover, and catch up on our journal! This afternoon we will go about 40 or 50 km down the coast. And on to the Highlights! One of the amazing parts of biking this route is how many other cyclists we have met along the way. Just about everyday we have met other folks cycling all or some portion of the US pacific west coast. We ended up on a similar schedule with a couple from Seattle, John and Emily. 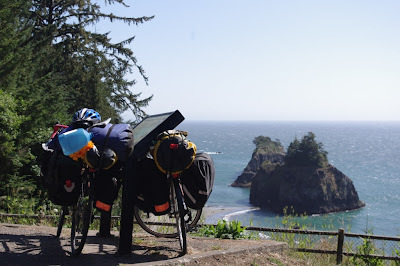 They are pedalling down to San Francisco and are also into finding some sneaky camping spots. Since we were not always riding together, we decided that we would need to secret way of letting eachother know if we had found a good place to camp. John and Emily came up with the brilliant idea of using bright orange artificial flowers...which worked once....see above for thier accompanying note. The only problem that we discovered with leaving flowers on the side of the road as a marker, was that people also leave flowers on the side of the road for other reasons...namely when someone has passed away in that spot....oops. We had some great camping spots with John and Emily. One night we camped in the yard of some folks who are actually opening a hostel for cyclists, and it turned out they were having a potluck that night with friends to prepare for a protest the next day. This was an incredible group of people who had come together to oppose a charge of manslaughter that a midwife was facing, which they felt was unjust. You can read more about this story here. We also found a beautiful camping spot on the beach with John and Emily and had a great time 'kite fighting' and playing in the sand. We hope that we will see these lovely folks again in San Francisco! What was interesting about our brief return to the laps of luxury, was that it was very easy to fall back into...especially having wifi access, TV etc.... These bits of technology sucked us right in and before we knew it hours had passed with our brains and our computers merging into one. Eek! Although it is sometimes hard to appreciate, living with some distance from the devices has been pretty remarkable. We have talked a bit about our budget in previous journal entries...basically we are extremely frugal. But lately I have been thinking about the broader economics of this choice that Glenn and I have made, which of course leads to larger questions of and conversations about politics and the world. When I make decisions, I tend to ask myself "how would I feel if everyone else made this decision". For example, I think that if everyone else decided to become a vegetarian, or ride their bike more often the world might be a better place.... Perhaps it is the long long hours of solitude, but I started to think about what would happen of everyone decided to quit thier jobs and ride thier bikes around the world (I know, The likelihood of this happening is very small).... But it wouldn't really be possible. There wouldn't be food, roads would not be maintained....chaos might ensue. I keep thinking back to my first year economics class, when we learned about 'freeriders' and how bad they were for the economy and capitalism....and I think that in some ways we are being free riders. But, this then leads to the question, do I want to be good for the economy. As I lamented about this, Glenn cleverly suggested that perhaps by using things that would otherwise go unbought or thrown out we are 'adding value'....which is definitely good for the economy....? Whether or not it would be good for the world if everyone decided to go on a bike tour at once... I think that it would be good for the world if more people followed their dreams, and lived in diverse and ways....So much to ponder, and many hours to think about it. One of the many many joys of bike riding. Another Milestone....it gets stranger and stranger! 5555km! Withalmost 6000 km on our bikes for this trip my bike has held up pretty well. Glenn has had a bunch of stuff replaced, but for me it has only been new tires, pedals and handle bar tape. Our plan is to get an overhaul in San Francisco, probably we will replace the rest of our wheels and I may need a new back cassette and chain.....Anyways, a few hundred kilometers ago we were speeding down a hill and I hit a rock, probably about the size of my fist. By some miracle I just swerved a bit and did not fall...but as I continued down the hill I just heard crunch crunch crunch. If you take a look at the slides how you will see that I put a good dent in my rim, which consequently bent my rim. We were able to straighten it enough so the brakes don't rub... And the current plan is to hold off until San Francisco to buy a new rim so that can get a good strong one....wish us luck! Northern California is home to the most amazing and humongous trees....to illustrate we have a couple videos :). It's a Bike Thru Tree!